This is actually part of the city I have only hurried through on my way down (it's a hill) to places that I thought would be more interesting, such as the National Museum (large building, upper right). It turns out that this area they call the Cavone is interesting in its own right, geologically as well as in the urban history of the city. 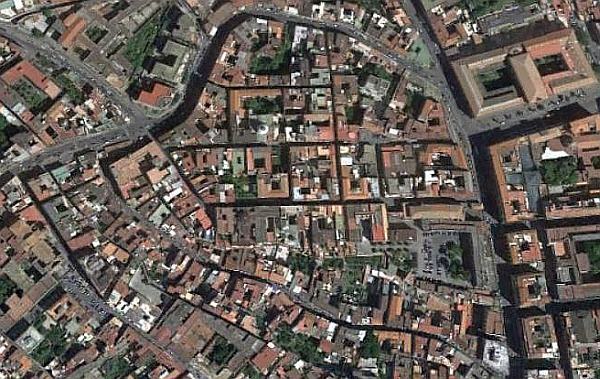 The Cavone is the area of Naples defined by the large jigsaw-puzzle piece in the image—that is (1) the large curved road at the top, via Salvator Rosa (it keeps going at mid-left off the image and runs up to the top of the Vomero hill), and (2) the wavy road angling down from center-left to lower-right, via Francesco Saverio Correra (ending at the white building). With a bit of fantasy, the area sort of looks like a dog's head with the snout facing left. Via Salvator Rosa used to be called the Infrascata and at one time was the only way to get from the center of Naples up to the top of the Vomero. That was well before the age of real transportation; you walked up or hired a mule. Those two streets are curved because they follow the natural path of torrential water courses flowing down from the upper reaches of Naples to the bottom over the centuries. Geologists tell us that the Flegrean volcanoes laid down the large tuff mass, the solid rock substance of the hill beneath the loose top soil between 40,000 and 20,000 years ago. Then the area around via F.S. Correra was marked by a deep gash from running water on the surface. Those waters branched into two currents, the south fork being via F.S. Correra and the north one via Salvator Rosa. You can see that fork in the image at the point where the two roads divide (at the tip of the dog's snout!). Those two branches, together with via Pessina (the straight road on the right that runs up past the museum) bound an area of some 80,000 sq meters (about 20 acres). That is the Cavone. Via F.S.Correra winds its way down 560 meters from that fork to connect via Salvator Rosa at 80.5 meters above sea level with via Pessina at 39.9 m. That is a 40.6 m drop at a 7.25% gradient. The hill remained heavily wooded, uninhabited and inaccessible for centuries until the king put up a hunting lodge called la Conigliera (rabbit hutch) at the bottom of the hill in the late 1400s so he could go bunny hunting. It was where the white building at bottom right (today, Palazzo Luperano) now stands. The etymology of cavone suggests both geology and urban history. The basic Italian noun is cava; that usually means "quarry" (the verb cavare means "to extract") but can also mean a "wash" (in the sense of a gully or depression that channels water, since the water extracts or digs out the soil and rock). The -one suffix is an augmentative; that is, the hill is either a big quarry or a big gully. It has been both over the centuries. The rains, indeed, swept down this hill as they did down other hills just to the north, flooding the area above the museum, called Sanità. But they also swept away the topsoil and lay bare the body of the hill, yellow Neapolitan tuff (or tufa), a porous volcanic rock that has been the most prevalent building material in Naples forever. And in the "washed" places, it was accessible right from the surface. That is where "quarry" comes in. The Cavone first began to develop at the beginning of the 1600s. It developed quickly. The hill was essentially a giant tuff mine; quarries opened up and blocks of rock came tumbling out to build churches, monasteries, convents, private dwellings and even large storehouses. As the city grew above ground, it also produced a kind of empty reverse image of itself below ground—with the emphasis on empty. The quarries all need tunnels, the inhabited buildings all need wells and cisterns, the wells all need to be connected to the aqueducts with channels, etc. It's not long before the inside of the hill looks like Swiss cheese. That is potentially a dangerous situation, one that is repeated in many areas of the city; there are simply too many people on ground that has been "emptied out". There have been numerous cave-ins and sink-holes in Naples over the years, and though many of the quarries served benevolently as air-raid shelters during WWII, they can turn malevolent on you in a heartbeat in the midst of overbuilding and overpopulation. The situation in the Cavone, thankfully, has been relatively stable over the years—with one exception. During the night from Friday to Saturday, March 13, 1982) behind via. F.S. Correra 207 (about halfway along that wavy road) an entire tuff wall collapsed; several tons of hard stone slammed down onto and crushed the two-story building at that address, killing one person. A greater tragedy was avoided only because the inhabitants had been forewarned by a fall of single smaller blocks of stone and had enough time to get out of the building. Subsequent inquiry was hindered by the rush the city was in to fill up the site of the collapse with concrete, but it is likely that all the holes...well, they can act like perforations in paper. One of the engineers trying to investigate things said they noted the presence of 400 wells in the area. They are no longer in service since the coming of modern high-pressure water lines, and most of them have been filled with loose rubble; also, tunnels to many of them are flooded. (The gentleman in the photo, left, was one of the team. You couldn't pay me enough to do that job!) Rain run-off accumulates in the old cisterns and well-shafts and puts pressure on walls built up against the hill. And so on. Part of the problem is overcrowding. The hill wasn't meant to support a population density of 40,000 inhabitants per square km! That is much higher than the rest of Naples, which in any case has the highest population density of any large city in Italy. Forty thousand is astronomical, higher even than "the most densely populated towns in Europe" (those along the coast on the run out to Vesuvius where, for example, Portici has 12,000 per sq km). But the Cavone is just a small hill packed with people. From the air, it doesn't look like what it used to be—a small hill packed with rabbits.